Last week, we raised a $45 million Series A led by Kleiner Perkins. We took an unusual approach in raising our A, starting with the fact that we had no formal Pitch Deck. Instead, the centerpiece of our fundraising materials was an Investor Memo, which laid out our pitch in prose. Accompanying the Memo were 46 slides of metrics, projections, and detailed methodology footnotes; rather than share these as siloed Excel sheets at the diligence stage, we packaged them before the pitch. Memos are great for storytelling, but data needs to be presented visually, and this is where slides thrive. Fundraising success is ultimately driven by the business you’re building and the problems you’re solving for customers. The quality of the materials you prepare and tactics you use during the process are a much less important optimization. But we want to share our process because we think some of the things we did could be useful to other entrepreneurs and could help fundraising proceed more smoothly for both companies and investors. 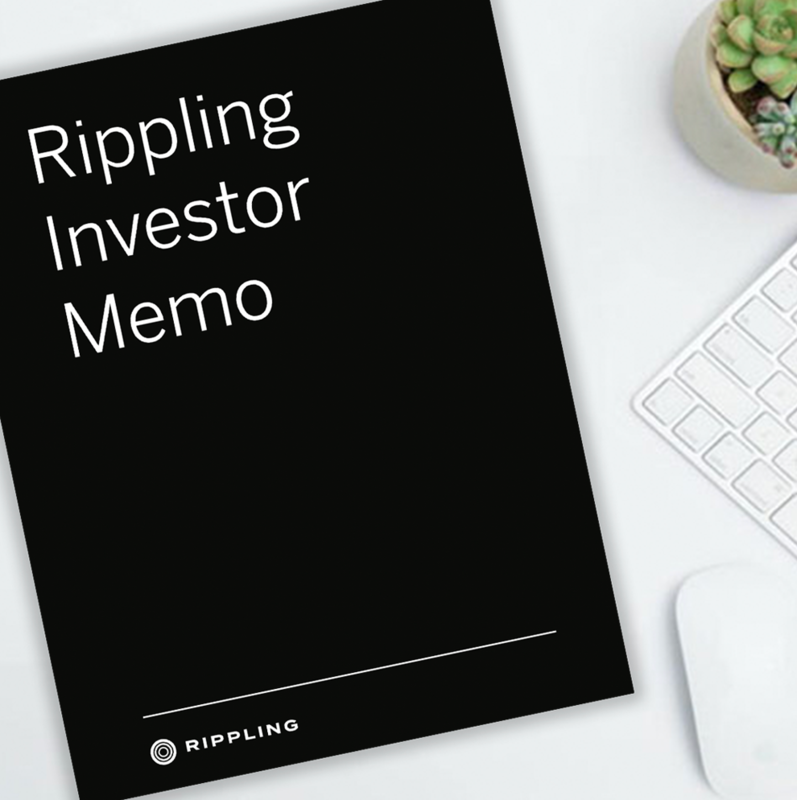 Download a lightly-edited copy of Rippling’s investor memo here. Pitch decks are the default format for startup fundraising, but they have one major downside: they’re merely a visual aid to accompany an in-person presentation. The spoken presentation is as important as the visual one but, inevitably, you’re not always there to deliver it. The associate you meet with early in the process can’t forward the spoken part of your presentation to their General Partners. One GP will really dig in with you and understand the business backwards and forwards—but the rest of their partnership might only breeze through your deck. And something’s lost when you can’t be there to walk someone through the deck in person. It’s standalone. You can send the memo in an email and don’t have to worry about someone reading it without you there to walk them through it. It requires less up front face time. Not every fundraising process is competitive but when it is, things move quickly and the rate-limiting factor is often your time as an entrepreneur. There are only so many hours in the day, and this imposes a natural constraint on the number of firms you can seriously engage with. Sending a standalone pitch memo up front helps you, and the firms you’re pitching, quickly identify whether there is interest so they can either make your company a priority, or let you focus your efforts on firms with which you are a priority. It aligns more closely with the material your sponsoring GP will ultimately put together about the investment. The final step in a VC’s evaluation of an investment in your company is usually a Monday morning full partnership meeting.If you’re fortunate enough to get this far in the fundraising process, you’re not the only person in the hot seat anymore. Typically, the General Partner who is looking to lead your deal has to write a memo laying out the case for the investment. So while you’re practicing in front of the mirror on Sunday night, your GP is poring over their notes about your company and deck to prepare their memo for the partnership. If you’ve already written this for them, it makes it more likely they’ll present your company in the right way to their partners. Download a modified copy of Rippling’s fundraising metric deck here. Our memo shared the story of Rippling — the problem we’re solving and why, where we might be headed, and how we’re going to get there. The Metrics Deck showed investors a clear view of Rippling today. Our goal was to anticipate every question and data request that investors would have, and provide it to them up front, so firms that were excited about the opportunity would be able to move quickly and wouldn’t be blocked on us pulling material together. We didn’t anticipate every request, but most of the information investors needed was prepared in advance, which meant the most interested firms could move quickly. A summary slide of KPIs: Total ARR, Last 4 Months MoM Growth, YoY Growth, 12 month Cohort Expansion Rate, Average NPS Score, Sales Rep Payback Period. Core financial growth metrics: Bookings ARR, ARR Growth, Cohort Percentage of Expansion, Expansion ARR in dollars compared to the sum of downgraded and churned ARR, Gross Margins, Burn Rate. SaaS-specific metrics: Quick Ratio, Magic Number. Sales and marketing efficiency metrics: Demos Scheduled by Source, Quota Attainment, Average Deal Size, Cash on Cash and Sales Rep Payback, Customer Acquisition Cost, CAC Payback Period, NPS Score. At the end of the metrics deck, we wrote out detailed footnotes for each slide; we clarified how we cut the data, how we calculated the various metrics, and any other assumptions we made. This drastically cut down on the number of emails we traded back and forth with VCs clarifying what exactly each chart showed. Finally, we included an appendix deck with additional data we thought investors might want to see, but which seemed too detailed for the main deck: sales rep ramp curves, close rates from demo by segment and cohort, revenue by industry, and a few other items. Again, you can download a modified copy of our fundraising metric deck here. We are thrilled to be partnering with Mamoon, Ilya, and Kleiner Perkins. Ultimately, they invested in us because of the Rippling product customers love, not because of our pitch materials. Nonetheless, we hope this approach helps other startups with ambitious ideas receive funding.